Happy Friday y’all! 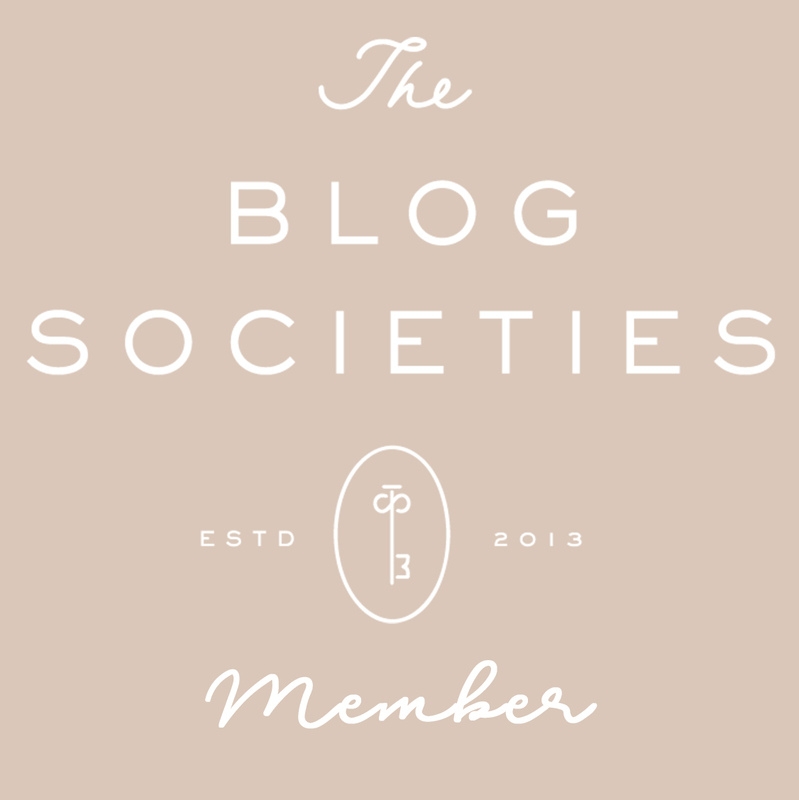 One our blogging goals for the year was to branch out into other areas besides just fashion and shopping. We are moms and wives after all, which means we do a lot of cooking! You can view our other recipes here and here! Cooking is one of my favorite jobs. I love winding down the day in the kitchen with a glass of wine and good music playing. It’s even better when the kiddos and hubby love the outcome. I have some pretty deep southern roots, so recipes such as fried green tomatoes, fried okra, chicken and dumplings and greens are all things I love to make. They are delicious, but all that frying and fat can leave us with an undesirable waist line, so for one of my favorite southern recipes, I thought I would lighten it up and create a salad version. Arugula is one of my favorite salad greens, so I knew it would be a perfect match with the salty tomatoes! This is a recipe I created a couple of years ago, and of course there is a secret ingredient that I am letting you all in on. For the corn meal, I use a box of Jiffy Corn Bread Mix! 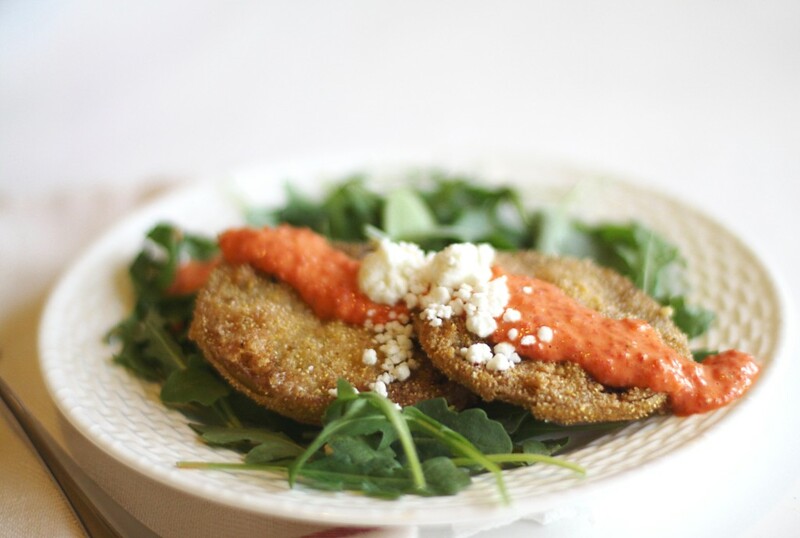 I wanted to make Fried green tomatoes when a friend brought some fresh green tomatoes to my house. I didn’t have any corn meal, but I did have a box of this cornbread mix, so I thought, “What the hey?” the boxes cost all of like 50 cents so I used it to bread the tomatoes and it was a huge success! Slice the tomatoes into 1/4″ slices. Sprinkle with sugar and allow to drain on paper towels. While tomatoes drain, in a bowl, whisk together the package of Jiffy Corn Bread mix, cornstarch, salt, pepper, and paprika. In a separate shallow dish, whisk the 2 eggs. Fill a skillet with 2″ of vegetable oil. Enough to fry the tomatoes, and let the oil heat up. You’ll know its ready when a few drops of water “pop” when added to the oil. Dredge the tomatoes in the egg wash, and then in the corn meal mix and add to the fryer. Fry each side for about 3 minutes until golden brown. Remove from grease, drain on paper towels and sprinkle with salt. Place tomatoes on a bed of Arugula and garnish with crumbled goat milk and roasted red pepper aioli. Combine all ingredients in food processor and process until smooth. This is also delicious on crab cakes (coming soon)! This recipe serves 4, but it also looks amazing on a platter as an appetizer. Enjoy with a glass of white wine and good friends! **Don’t forget to enter for a chance to win a $150 Sephora Gift card! Click here for entry details. I love southern fried tomatoes, but haven’t had a really good one in a while. This recipe sounds so yummy. I put it on my weekend menu! Thank you for sharing! i love this! that is genius idea idea of using jiffy (the best) cornbread mix!! 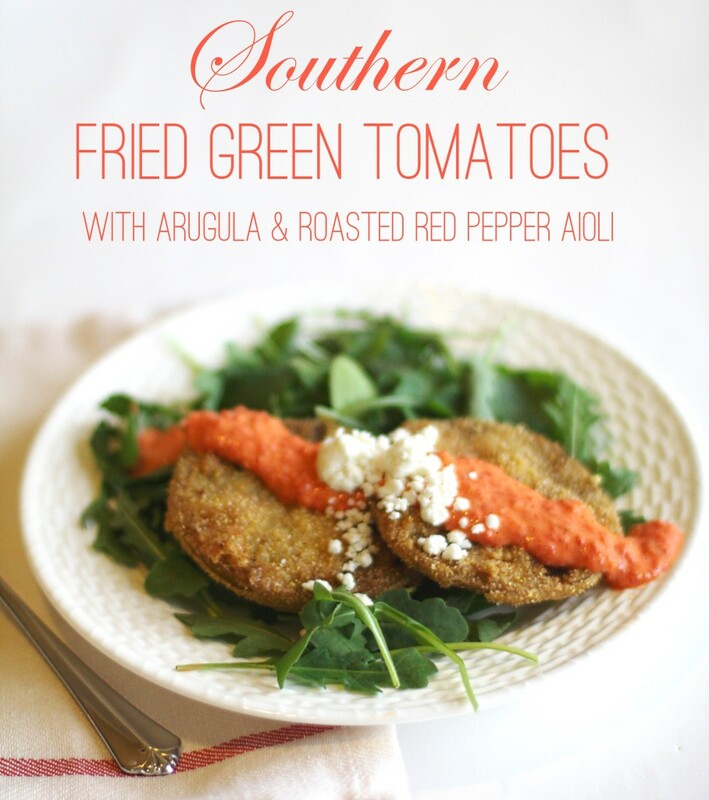 the next time i make fried green tomatoes, i’ll try this. thanks for the idea! So funny that you payed about fried green tomatoes! I just borrowed a book from the library by the same name!! I’m even more excited to start reading it now! Oh my YUM! I seriously love fried green tomatoes! Ive never had these before but always wondered how they tasted. These look great! Yum this looks amazing!! My parents live in South Carolina and I always love ordering fried green tomatoes when I go down to visit! I’m so trying this! I love fried green tomatoes. Cornbread mix sounds very interesting to try! These look so tasty AND pretty. I’ve never tried this, but totally willing to! Looking forward to more recipes! Hope y’all have a great weekend! 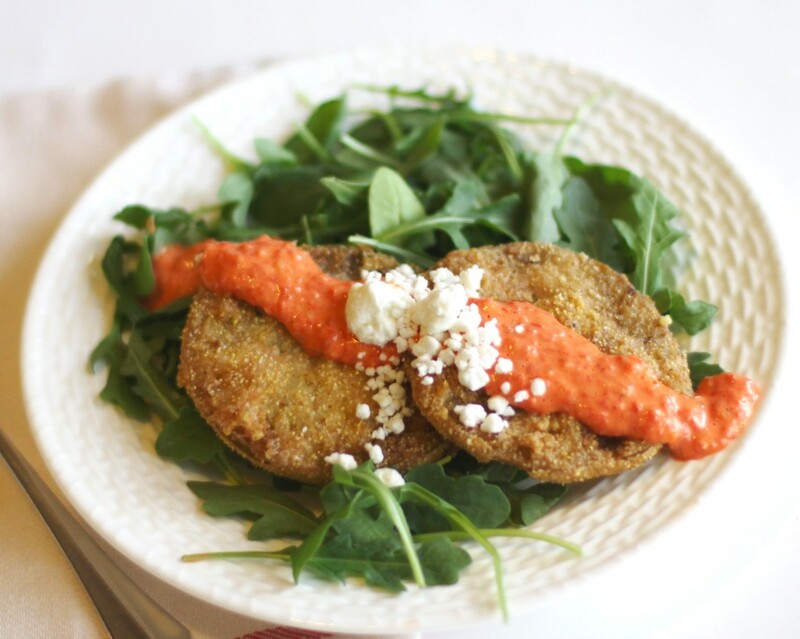 I absolutely love fried green tomatoes and your twist with the roasted red pepper aioli looks so delicious. I can wait to try this recipe with the tomatoes I’ll be growing in my garden. Yummy! I’m looking forward to making this! This is great. You can’t beat fried green tomatoes …..we like to top our fried green tomatoes with crab meat and white sauce. Would love to try this recipe. The Fried Green Tomatoes look very delicious. I am making this on the coming weekend for a party. I thank you for sharing.